Irish, UK, European and worldwide removals | Removals from UK to Ireland, Removals UK and Ireland. Worldwide specialist movers, piano removals, shipping and storage in our state of the art facility in Waterford, Ireland. 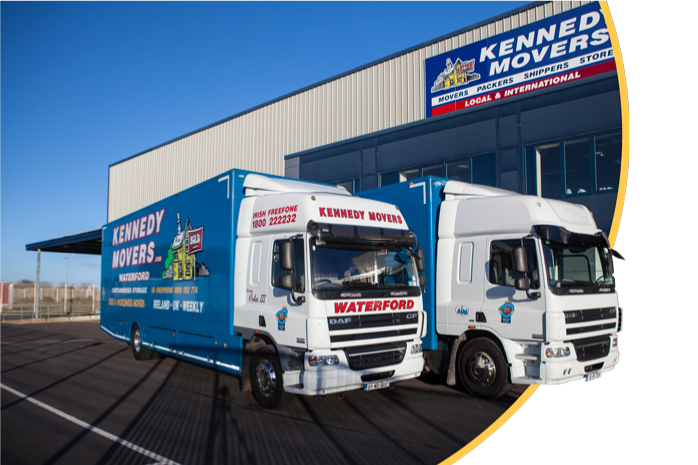 Kennedy Movers have over 25 years of moving experience, from pianos to entire offices, and more house moves than we can remember! We specialise in removals between the UK and Ireland as well as European and worldwide removals. We offer weekly removals to the UK from Ireland and, of course, removals to Ireland from the UK. I have been using Kennedy Removals and their storage facility for over a decade. They are professional, efficient and extremely pleasant to deal with. Brian Kennedy treats furniture as if it were his own and is very careful and particular about packing and moving. He has moved our grand piano three times now. Kennedy Removals rivals any of the International removal companies I have used for price, professionalism and quality of service. I am delighted to recommend them. Kennedy movers moved myself and my family form the UK to Tramore. I was extremely pleased with the service from their team. They arrived on time, packed and loaded all my furniture with a few extras - no problem. They arrived in Tramore to our new home on schedule, unpacked and built furniture and placed it in locations as required, they also took any waste away. I was extremely happy with the service and the value I received. So much so I recommend them to anybody I know who is moving as they are very professional and trustworthy. If moving again I would not hesitate to contact them. I was initially nervous moving abroad and using a removal company to handle my possessions. Michael and Brian put me at ease and were brilliant. I couldn't believe how easy and stress-free the process was. I had already moved to Ireland, but they collected my items from my house in the UK and delivered them very quickly. Kennedys were very personable and efficient, and I always had full confidence in them from start to finish. I can't thank them enough and would highly recommend them to anyone moving to or from Ireland. I am very tardy in getting back to you about our move from Blackrock. You and Karsten (hope I got the spelling right!) were both so kind and unbelievably fantastic. Not to mention very hard working . . not forgetting Michael who was really amazing on such a horrendous time for us . We very much appreciate your absolute devotion and total assistance to us. Many thanks. We've used Kennedy Movers twice ... Once to the States and now back again. I can't sing their praises enough. Wouldn't use anyone else. Thanks lads. I have been fortunate to have chosen to use Kennedy Movers on several occasions for both National and International moves. I have found them to be excellent caring and a customer first Company. They're attention to detail , packing quality especially with important and valuable pieces to be superb. I have no hesitation in recommending them for all your moving requirements.